Grantham Journal 1896: appointment of Dr Glover. John Hastings Glover is one of the men named on the Bottesford ‘church list’ of WW1 Servicemen. He was a doctor and surgeon in Bottesford from 1896 until 1915, when he left to join the RAMC. During this time he was also Medical Officer of Health and Public Vaccinator serving Belvoir Rural District Council and Board of Guardians. His service career was evidently spent in the thick of the military action in France and aboard Hospital Ships, though there are few details of what he actually did. It appears that he did not return to Bottesford after the war. There is one record which indicates that he returned to work as a doctor, probably in Yorkshire, and hints that he may have retired to Ireland and died at Roscommon in 1941, aged 70. John Hastings Glover was born in Londonderry, Ireland, in 1871, and trained in medicine in Edinburgh. In the census of 1891, he was recorded lodging at Oxford St, St Cuthbert, Edinburgh, when he was a twenty year old medical student, sharing his digs with another medical student, Robert Bruce Majoribanks, from India. The Medical Register from 1913 recorded that he was registered 1st August 1893 M.B., Surgeon, University of Edinburgh. No further detail of his background and early years has been discovered, though subsequent events such as his building of a seven-bedroom house in 1903 in Bottesford, suggest that his family were wealthy. In the census of 1901, John H Glover, a 31 year old ‘medical practitioner’ from Ireland, lived at 56 High St., Bottesford, together with his older sister Annie (b.1866), Emma Coronis, a 35 year old ‘hospital nurse’ from Wiltshire, and Florence Topps, a 21 year old domestic servant from Muston. This address was adjacent to Claremont House, on the High St, and was probably the house known today as The Thatch. This was before John moved into the house he had built in 1903 further along the High St, in what had probably been the garden or yard of The Elms. In the 1911 census, this address was given as 41 High St, where he lived with two servants, Nellie Smith (36) from Bingham, and Agnes Louisa Tinkler (24), from Muston. The Grantham Journal, on the 13th April, 1912, reported that he gave a silver tea service to Agnes Tinkler on her wedding to Ernest Wakefield. It seems, however, that Doctor Glover never married. There are no reports of a wedding, despite the frequency with which he appeared in the Grantham Journal, nor is there mention of a wife in the census of 1911. Bottesford has long benefitted from having two medical practices in the village. White’s Directory of 1863 and the Post Office Directory of 1876 both named two surgeons in Bottesford, Jonathan Felix Singleton and James Wright, both based on the High Street. However, Wright’s Directory, 1888, named John Sheppard, surgeon, based on Mill Lane (now Belvoir Road), and James (Jas) Wright medical officer Grantham Union, and the same two medical men were named in Kelly’s 1891. In 1894, James Wright’s son, Frank Marsh Wright, surgeon, bought Clarence House, High Street, but died on August 23rd the next year, in a tragic accident at Bottesford Station. Clarence House was inherited by his father, who retired in 1896, and died in 1907. In 1899, Wright’s Directory named G.H. Glover as a surgeon living on the High Street, and another surgeon, John Sheppard, who lived on Belvoir Road. Likewise, Kelly’s Directory of 1899 includes “Sheppard, John MRCS Eng, surgeon” and “Glover, J. Hastings, M.B. surgeon & medical officer & public vaccinator, Bottesford district, Grantham Union, & medical officer of health to the Belvoir Rural District Council”. In Kelly’s 1908 Directory, Dr Glover’s entry had been expanded to “Glover, J. Hastings, MB CM surgeon (firm Glover & Martin) … “, indicating that Doc Sheppard had retired and a new medical partnership with Francis Martin MRCS Eng. & LRCP Lond had been established. These entries were repeated by Kelly’s in 1912 and 1916, even though by the latter date John H Glover had joined the RAMC and a temporary replacement, Dr McDonald, had been appointed. It is likely that John Hastings Glover first came to Bottesford in 1896, following Frank Marsh Wright’s death and his father’s retirement. His name appeared in the pages of the Grantham Journal repeatedly from 1896 to 1915, but only infrequently later on, when he had ceased to be part of the village. On the 29th August, 1896, the Journal reported that he attended a fatal accident: ‘Fatal Result of a Fall from Stack – The accident … befel Mr George Gibson, of Easthorpe … engaged in thatching Mr Richmond’s, Muston … had a fatal termination … Dr Glover attended … a fractured dislocation of the spine … quite sufficient to cause death”. Other reports include one in which he treating 4-year old Ethel Bend when she was knocked down by a horse and cart in1899, and another in which he treated a man’s leg broken in an accident in Granby, also 1899. Prominent among the press reports were his presence at meetings of the Grantham Board of Guardians and Belvoir Rural District Council. The Guardians initially appointed Dr Sheppard as Medical Officer of Health in 1896, but later that year appointed Dr Glover in his place, and he then held this position until 1917 when he finally stepped down. He was heavily involved with the general health of the villagers and the poor state of their water supplies and sewerage in relation to typhus and other diseases that were common at the time. In 1897 his report following “house-to-house inspection” was presented to the Board of Guardians, though “further consideration was adjourned”. In 1898, he reported again on the sewerage problem in Bottesford and the question of sinking a well at The Ferns. In 1899 the Parish Council accepted his report on the village water supply (though we are not told what they did about it). In 1900, he told the Guardians that “a pail system should be adopted for Bottesford for privies”, and later he reported on typhoid fever in Knipton and scarlet fever in Croxton in relation to water supplies and sewerage problems. In February 1914, he reported on measles, saying that sixty homes were affected and ninety children were sick, the school closed. Later, in May, he reported on outbreaks of scarlet fever and phthitis in relation to bad water. The reports also reveal that from about 1905 he was absent from the village for prolonged periods, though it is not clear where he went or why. 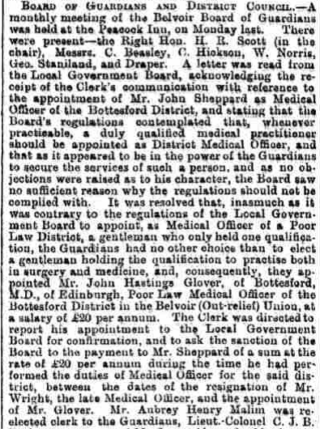 The Journal of the 26th June 1905 describes an exchange at the Guardians meeting between the chairman and Dr Bennett regarding Glover’s absence: this is a rare mention of Dr Bennett, who must have been a short-lived appointee as Dr Glover’s assistant Medical Officer after Dr Sheppard retired. Even so, Dr Glover was reported speaking in support of nurses at the Aslockton, Scarrington and Hawksworth Nursing Association during that same year. In 1907, the Guardians and RDC accepted his letter nominating Dr Martin for the “re-supply of medicines and other attentions, at Dr Glover’s cost, during his absence from home”. He was also prominent in village social life. In 1897, he was one of those who subscribed to the Diamond Jubilee clock mounted on the village school (it is still there). In 1898, he exhibited for the first time at the annual village Flower Show, and also in that year he joined Dr Sheppard and the Rector in contributing £1 each towards repair of the billiards table in the Reading Room (in the Coffee House). In 1897, he consented to take the chair of the Bottesford Football Club, and was annually re-elected thereafter. In this year he also took a part in the village theatrical production. In 1900, he was mention playing tennis at Harby, at the Bottesford Cricket Club dinner and taking part in the village whist club. In 1911, he was reported making a speech in favour of provision of Coronation Seats at the roadside. In 1912, he supported a Grand Concert in support of the Brass Band Fund. In May 1914, the Journal informed its readers that Dr Glover had enjoyed his golf at Belton Woods. In 1899 he attended the anniversary meeting of the Bottesford Friendly Society, where he was toasted and re-elected to the committee, and also made a speech at the anniversary meet of the Norton Lodge of the Oddfellows. He was a regular speaker at these meetings, and evidently a keen advocate of this form of welfare provision. In 1914, though he did not enlist immediately, the mood abruptly changed. Already that year, on the 28th March, it was reported that Dr. J.A. McDonald had been appointed as a third Medical Officer in Belvoir, though Dr Glover was still reporting to the Guardians. It is not clear why this happened, in that Drs Martin and Glover were still in post. It may be that it was in anticipation of that war would begin and the willingness of Dr Glover to join the forces should the need arise. On the 17th October, 1914, he made a speech in support of the Belgian refugees camp that had been established at Belvoir, in which he added that “the Bottesford Roll Call now contains the name of thirty five men who are serving their country in either the Navy or Army”. John Hastings Glover became a Captain in the Royal Army Medical Corps (RAMC), serving in France and on hospital ships between 1915 and the end of the war. An entry in the Supplement to the London Gazette reported that he had been promoted to Temporary Lieutenant on the 15th January, 1915. 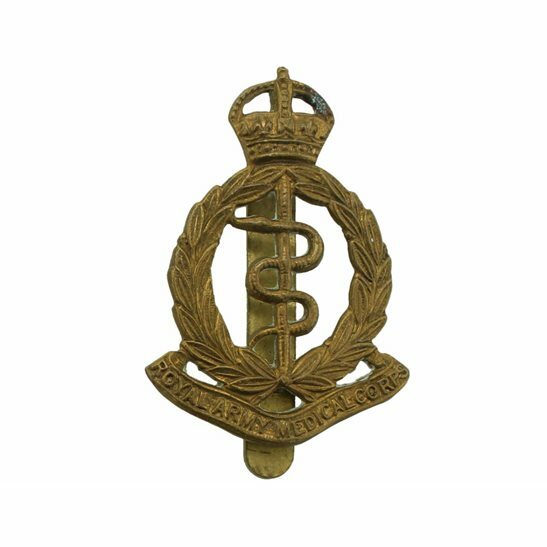 Meanwhile, on March 27th 1915, Dr McDonald was re-appointed as Medical Officer for Belvoir RDC, Dr Martin remaining as an assistant MO. Also in that month, Dr Glover’s residence was advertised to be let, furnished. However, it was not until November 10th 1917 that Dr Glover formally resigned his appointment as Public Vaccinator for the Bottesford District, and the Journal reported the need to appoint a successor. Evidently, Dr Glover no longer expected to be able to return to his old life in the village. His military record found in the Forces War Records (FWR) website adds that he was further promoted on the 16th January ,1916, to Temporary Captain RAMC: he was now 45 years old. The Journal added, at this time, that “We understand that Dr Glover has been staying in London recently and leaves for abroad again today. The best wishes of Bottesford people go with him”. He must have already been in France during 1915. There is a record of a John H Glover who served with the French Red Cross which may refer to this period. On the 7th July 1916, the Grantham Journal reported that Dr Hastings Glover in hospital, with a shrapnel wound in his thigh received probably in the opening days of the Battle of the Somme. The record provided by FWR also includes the comment that he had been “torpedoed three times”. Later mentions in the London Gazette confirm his service on hospital ships. On the 3rd September 1918 the citation relates “Mentioned in Despatches. His name has been brought to the notice of the Secretary of State for War for valuable service rendered on the occasion of the sinking or damage by enemy action of Hospital Ships, Transports and Store Ships.” On the 9th January 1920 J.H. Glover was one of the “NCOs brought to the attention of the Secretary of State for War for valuable services rendered on Hospital Ships during the War”. 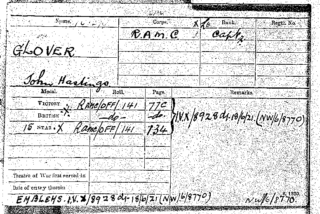 His Medal Index Card confirms that he was a Captain in the RAMC, and was awarded the 1915 Star, Victory Medal and British War Medal. There is very little to add in relation to Dr Glover’s life after the war. He has not been found in Electoral Rolls from the 1920s, nor in the 1939 Register. However, one snippet came from a report in the Hull Daily Mail of February 2nd, 1925, about a child custody case, in which one of the witnesses was Dr John Hastings Glover, medical representative of the Ministry of Pensions. There was a Mr J H Glover who travelled to Queenstown (Cork), Ireland, on the 5th May, 1938, from Liverpool, aboard the White Star Line “Celtic” bound for Boston and NY. This could have been Dr Glover, now aged 67, returning to his roots in Ireland. There is also a record of a J Glover who died in 1941 at Roscommon, Ireland. Could this have been the doctor, now 70 years old? 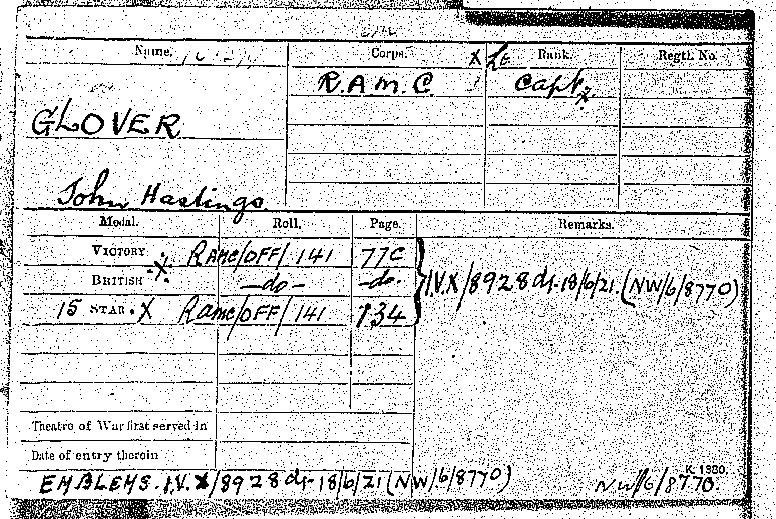 There are records of a JH Glover who was in the RAMC during the Boer War. Thus, Boer War Records record Private 5953 JH Glover, 6th Battalion Lancashire Fusiliers, joined the Cape Colony Medical Staff Corps, Queen’s South Africa RAMC and was awarded Medal Clasps: Cape Colony, Orange Free State, South Africa 1901. There is inevitably the temptation to conclude that this is the same man as the doctor in Bottesford, spending time with the army for the duration of the war then returning to Bottesford immediately afterwards. If this were not so, then there must be a rare coincidence of names, which indeed appears to be the case. There are several pieces of evidence from the newspapers and the census that establish that Doctor Glover did not leave Bottesford for any substantial period during the Boer War, and therefore the JH Glover in South Africa must have been someone else. The place and date of Dr Glover's death are uncertain.